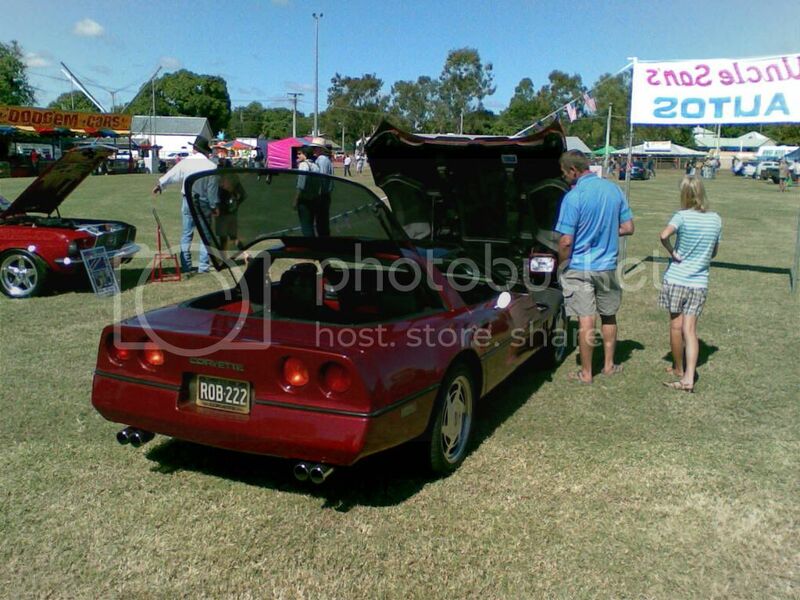 In June 2010 I drove the Corvette down to the Charters Towers long weekend carshow – a distance of about 481 kilometres (300 miles). My old sailing mate Reidy was visiting from NSW and he shared the driving. I spent a day cleaning, polishing and getting ready for the trip, including checking the engine over for loose connections and possible problems. We left Cairns just before 9am Friday morning. Bob’s Falcon Wagon with most of our gear was in the lead with Ross, his brother in law and Bruce in the wagon because both their Camaro’s are being restored. 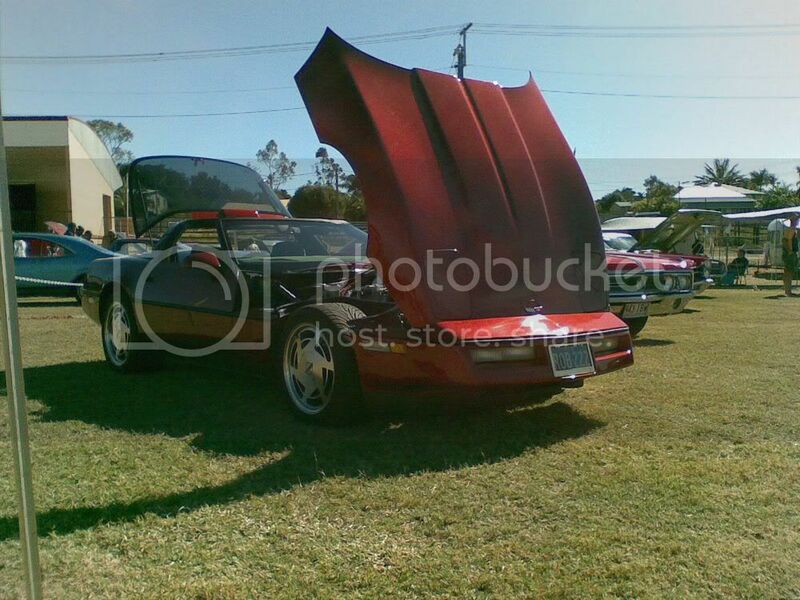 Bob drove roofless the 7 hrs to Charters Towers in his 76 Stingray, and we were at the rear in my 88 C4 Corvette. We had a sedate 2 hr drive to Cardwell where we stopped. I was busting for a pee and as I limped painfully to the toilet block at the servo, many body parts aching and my bladder full, I saw there was a cleaners sign barring the mens toilets- Oh NO!!!! Luckily the cleaner saw my distress and let me in!! Reidy was semi reluctant to drive because he was afraid to damage the vette. He is a fast motorbike rider but a careful bloke, I had no worries at all letting him drive. I got him in the drivers seat, put my hand over the hood and slowly moved it forwards, telling him to say stop when he thought I was at the front- he stopped me short by about 600mm !!! as expected. 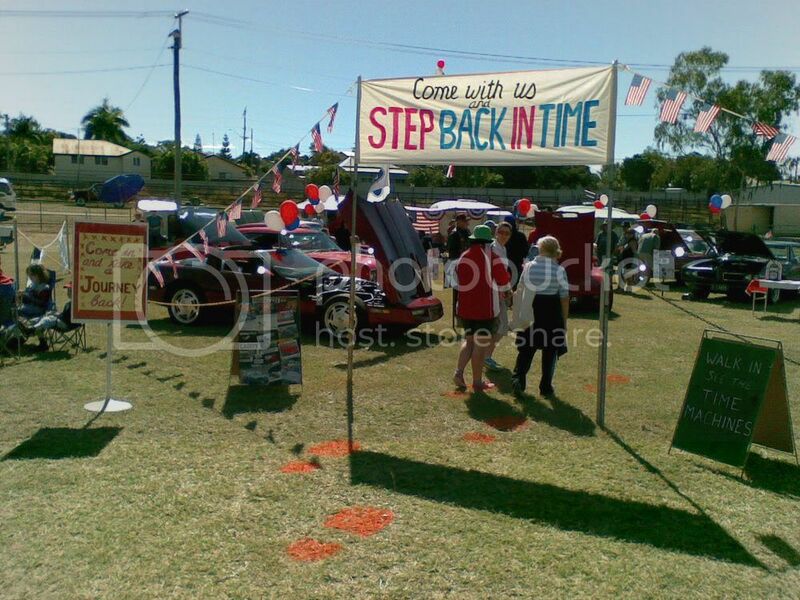 It’s always a good idea to know where the front of the car is and with that sorted, he drove two hours to Townsville. I found it extremely comfortable in the passenger side, more leg room and not having to concentrate. We played a few CD’s and time went by quickly. Soon we were at the BP fuel depo Southside of Townsville. We had some food there, hamburger and chips etc, refueled and continued the journey to Charters Towers. The outback road had some big B Double trucks plus caravans and cars with trailers going to the show. We arrived about 4.30pm and signed into the motel. We’d driven through a light shower and the vette was dirty so we gave it a quick shampoo while Bob waxed his car. We had a few beers then walked into town about 6.30pm to get some food. We couldn’t find any pubs that had people eating in them, which is our way of finding out where the good food is – the place was fairly dead for a Friday night. We ended up at a Chinese Restaurant run by Chinese people. Food was only average, grog expensive. It was v warm in there and v cold outside when we walked back to the Motel, the stars shining brightly in this old outback mining town. Bob, Bruce & Ross had the room next to us in the motel and we had a few more beers and lots of laughs, standing outisde, next to our Corvettes, then watched the footy replay on Foxtel TV before going to sleep. Saturday morning we drove to the showgrounds and had breakfast at 8.30am. I didn’t enter the competition, just happy to be part of the club display. 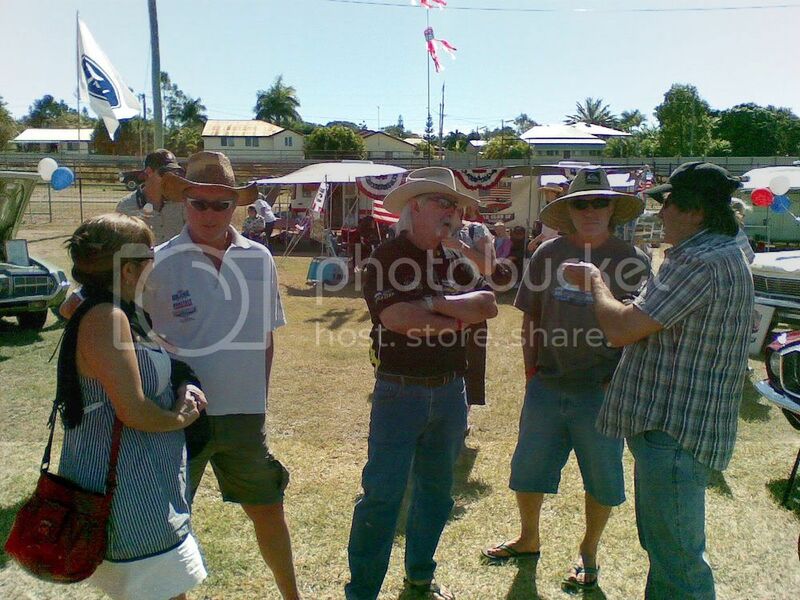 Many of the American Car Club committee have caravans and stay at the showgrounds on the spot where we display – they get use of the toilet block, water and electricity at real bargain prices, it looks like a good thing. What I reckon is funny is that some of them have huge American cars but tiny caravans!! 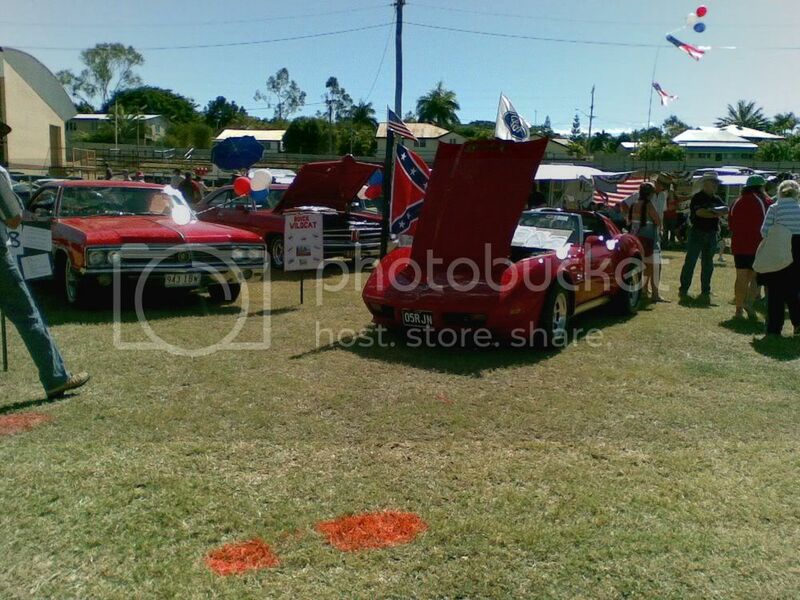 They had a good display planned and we helped to set it up – my vette at the front with hood up. Also notice the orange footprints we sprayed on the ground. We spent the morning looking at all the cars on display and walking through the swapmeet. I didn’t realise I had so much valuable old stuff at home, I saw several things at the swapmeet that I have just thrown out!! My right groin began to really hurt and continued to give me trouble all through the weekend whenever standing. I could ease it by sitting and sometimes go a few minutes standing or walking before it hurt again. It turned out to be a hernia. My damm body needs reconditioning!! We had a drive through the streets at midday. By then the sky was blue and the weather was perfect. Bob and I had a running gag for the 2 day show because whenever we are together, driving or parked, people always look at his Stingray and not my C4. This time I had a lot of people looking at mine and I kept calling out a viewer report to him, like 3 and none!! meaning 3 around mine and none around his. Around 4.30pm we drove back to the motel and had a few beers outside the motel room. Friends from Ingham hadn’t been able to book our motel this year, so they walked round from their motel to visit us and slowly an impromptu party happened under the stars. Eventually about 20 people were all drinking laughing etc out in the cold night air. The Ingham mob went to book the motel for next year and came back saying there were only 3 or 4 rooms left, so Bob and I swiftly went to re-book our rooms for next years Queens Birthday weekend. At about 9pm my ears were dropping off with the cold, I’m used to our hot humid Cairns weather. There were two old bikies with us and both were wearing beanies so I put mine on and stood with them for a while. Bob reckoned I looked like a big tough bugger standing by the bikies with the beany on. He said he looked up and suddenly there were 3 bikies and he wondered who the other bloke was!! hehehe it was me! We got hungry and ordered Pizzas for about 15 of us – there was a 90 minute delay!!! In Charters Towers!! By the time it arrived we were all v hungry and there was a Piranha like feeding frenzy to gobble as much Pizza as possible. Sunday morning we drove back to the show. This was the official judging day of the show and Bob had waxed his vette again the night before, it was so shiny that NOTHING could stick to it!! Mid morning a bloke I met on the Aussie Corvette forum, Troppo Vette arrived from Townsville and we had a long chat and looked at each other’s vette’s. His white paintwork is very good but he hasn’t had time yet to clean up the engine bay. He was reluctant to lift the hood – always a sign hehehe. I could see that it would clean up easily and he liked my chrome rocker covers. I appeared very knowledgeable about matters C4 and gave him some handy info- also to Rob Casper who had his gleaming red 87 parked beside Troppo. It’s amazing how much knowledge I have picked up in 7 years of vette ownership!! My thanks to everyone who is heping me on my Corvette journey. At 2pm we drove around the streets again then waited for the presentation at 3.30pm. Our club won the display last year and this year there really was no other displays worth mentioning so I was very surprised when another club won – hmmm, must send the judges some magnifying glasses- we had 3 helium balloons per car, a tall 5 metre mast with helium balloons and American flag stuff everywhere, every car had a poster saying what happened the year that car was built – BTW in 1988 Prozac was invented !! We drove back to the motel, had a few beers then at dusk walked to the RSL club about 2 kms away. The stars in the outback are amazing and reached almost to the horizon on this moonless night. On the way there John passed us in his Buick Wildcat, then stopped to pick up Bob & Ross who were 20 metres in front of us. Kel & Coral, Bruce & Helen also drove past us in their big American cars while Reidy, Bruce & I continued walking to the RSL. When we got there we heard there was not enough food for everyone, so John’s Wildcat and Bruce’s GTO ferried a bunch of us to the Waverley pub where we had thick juicy steaks and a very reasonable price. A few more drinks back at the Motel and we turned in around midnight. Woke up Monday morning 7.15am, loaded the cars, paid our bill and began the long drive home. Bob decided to keep his roof on and started off in the lead. We had breakfast just north of Townsville at a servo. Half chicken and chips filled a hole – $7. Reidy took over driving and we left first, a few mins ahead of the others. I plugged the MP3 player into the CD and we listened to an interview with Wayne Bennet among other things. We refueled at Cardwell and I took over driving back to Cairns. We saw some speed traps but they were all working the north-south side of the road. We arrived home 3.30pm, about 6 hours of driving and 30 mins of breakfasting. My vette used no oil during the trip. Water temps were too low, we only saw 73-79C most of the time, The radiator shop have put the wrong T stat in because I usually have minimum set at 84C so I will have to change that. Oil pressure was 63psi at 1900 revs which is good. As always it was the people who made the weekend – Bob, Ross, Bruce, the Ingham Crowd, the American Car club etc. Having my old mate Reidy along was a bonus, we’ve sailed thousands of miles together and had a ton of laughs along the way. He’s a retired aircraft engineer and has restored old jags as well as raced motorbikes so he was interested in everything at the show. I haven’t seen him for a few years and catching up was great.